April 9th, 2015 | Moving For Work, Moving Tips. Moving an office or business is a huge event that takes careful planning to execute successfully. If your company is planning a move in the near future, there are certain things you can do to make the experience easier on everyone. This includes you, the administration, employees, movers and anyone else involved. Simplify your life by using the four tips listed below to achieve a successful corporate move. What does it mean to start planning your move “early on?” The truth is, the larger your company is, the more time you’ll need to nail down the details. For a company of around 200 employees, you should be discussing moving rates at least four months in advance. This will give you plenty of time to choose a moving service that fits your needs and budget. As soon as you know what to expect from the company, you can make an informed choice about which moving service you’ll employ. Once you’ve made this important choice, stay in touch with the company to confirm dates and prices as well as to plan your ideal moving strategy. Communication is key to a successful move. Establish clear expectations to your moving company and employees. Every single person should be responsible for a specific job. Likewise, every single item should have a place. Make your team of employees and movers aware of these preferences so they can meet them. Give each department a checklist of things to accomplish by certain dates before the move. This will keep things clear and prepare you for the big event. As long as everyone knows their assignments beforehand, you’ll achieve a smooth moving process. Packing is what everyone thinks about in connection with moving, but it’s just the tip of the iceberg. In truth, packing is one of the final steps in the moving process. What will increase efficiency is preparing items (and employees) in advance. Have each employee start with their own personal area. Instruct them to pack away any loose items. This should prevent any messy mishaps. Next, have each department head manage the organization of their products, area and items. Companies have lines of delegation and authority for a reason, so use them to your advantage. Make sure you take special care when packing office décor. This includes artwork, curtain rods or blinds, rugs, etc. It’s useful to give your moving service a list of fragile items and how you would like them packed and transported. As an employer, the last thing you need during your corporate move is for someone to get injured. Take steps to train on the latest safety policies before the move, and provide all the necessary equipment. This could include back braces, dollies, lifting instruction, and thick gloves. 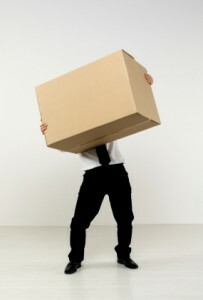 One important way to prevent injury consists of arranging packed items and boxes according to weight. Placing things in their proper category on moving day is always helpful, too. You should also create a sensible moving path from your location to the moving truck. Anything that makes things easier on the movers will help your move go off without a problem. Follow safety protocol and take precautionary measures to protect yourself and others from potential accidents. Consider each of these four steps as you prepare for your office relocation. When you do, your move can be successful for both the movers and the employees.